NOTE: This product is a Pre-Order and is not currently available. The estimated release date is Aoril 2019 (subject to change). Museum is about the wonders of the archaeological world, the light, the colour, the textures of these wonders of history put on display for all to see! What some don’t realise though is that there was a dark underworld that shadowed it. Welcome, ladies and gentlemen, to the Black Market, where anything is obtainable…if you can pay the price. 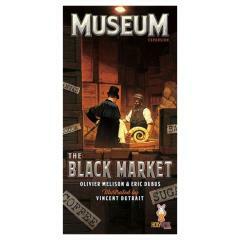 Black Market is the fourth expansion for Museum and adds a market system to the game where you may purchase Objects and Notoriety cards to complete your collections and harass your adversaries. For those of you looking to put a more aggressive emphasis on the interaction between players in Museum, this is the one for you! The 30 object cards featured in the expansion are all from civilisations outside of the ones present in the base game. You’ll know them by their rather unique appearance (Images coming shortly) and the fact that they only have one attribute! For example, there’s the Viking Longship that will only sport a Navigation Icon or maybe the Terracotta army, the famous guardians of emperor Qin Shi Huang which only counts as a Chinese card? These and many more are purchased exactly like any other object and can give your collections a much needed boost! Museum has always had a pleasant level of player interaction, with each player concentrating on building up their Museum. With these new cards though, you can throw many a wrench in your opponent’s plans! Purchased like an object card, they follow exactly the same rules as a standard notoriety card except their effects are much more aggressive. Steal objects, create counterfeits, and steal prestige right out from underneath your opponent’s noses! The ends justifies the means! All these new cards will be available on a separate market board (WiP). When cards first appear, they’ll cost more but as they stick around for longer, their cost will go down. So, do you shell out right from the start or wait for a better price at the risk of having them stolen out from you? The Black Market expansion includes 60 new Contraband cards (objects and Notoriety cards) as well as new characters, events and Notoriety cards. If you’re looking for a more aggressive stance with Museum then add it to your pledge!